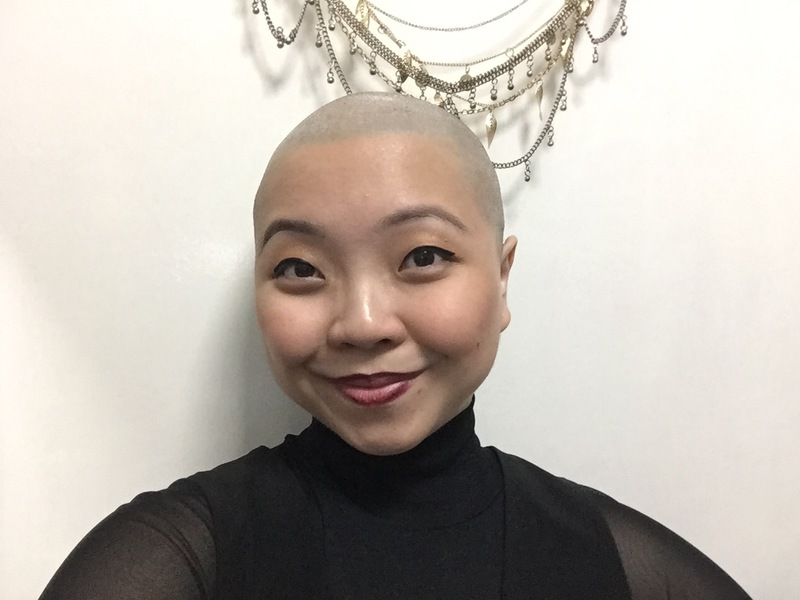 I was effectively bald for more than a month. One whole month and two whole weeks, to be exact. It is actually pretty high maintenance to keep myself skin-headed for so long. M scalp was drying out, I had to apply baby oil and the constant routine of having to shave my head in the shower. And it takes perhaps, half an hour to an hour to get it completely clean. No patches or missed spots, or back in the shower I go. However, despite the steps and care I had to take (way more than when I actually had hair), never did feel troublesome or tiring. I looked forward to it. Showering is already a cleansing, to rid of the hustle and bustle of the day from your skin. Wash it all off. Have the water run through every curve and feel safe alone in that little space. Water on skin. But shaving brings my mind to a quiet. Eyes shut and mind empty. All my energy bringing to my hands as I blindly guide myself through my scalp and let the blade glide through. I hear no more voices but glides, stops and the water running in a steady rhythm. Then I shampoo my head, feeling my scalp and finger tips massaging the head. It’s a meditation and a rare instance where I have to leave my mind, my inner dialogue to peacefulness, or bleed my brain out basically. That body for them to do so? A bird is chirping. The same tune over and over again. Not tired of its own voice. Convinced of its purpose, maybe. One day, a response will come. It will. Macdonald’s delivery driving through the gantry. I haven’t had dinner but I am not hungry. Food doesn’t tempt me as much as it should, though I am not losing weight either. A pity. People walk pass. Some avoiding my gaze and choosing to look at the pavement. Others, staring at my lack of hair blatantly and questioningly. Almost with a judgment. But I don’t feel affected, just curious. A boy is walking away from me. Also on the pavement. Just clapping. He’s alone. Clapping softly then louder and louder. But he is too far now. I can’t hear him anymore. He’s disappeared. The bird’s still going. Perseverance is key. I have twenty minutes to go. Text messages and emails are coming in. It feels good that people remember me and swamp me with work, plans. Sometimes. But I wonder what my self-worth is if I get these calls less. Maybe I will just answer them later. I listen to the little bird. Nowhere in sight but such a loud voice. Always so cheerful. Happiness is such a questionable thing. A lonely national day flag sways in the soft wind. Tilted just slightly towards the ground. What is the flag about, and what does it represent? Do I feel it in any part of my being? If I don’t, does that make me unpatriotic? Water runs through the sewers. White tube-shaped pipes snaking about the ceiling of where I am seated. How do they know where to twist and turn, to be right? These mechanics fascinate me, but nobody really talks about them until they dysfunction. The bird is quiet now. Flown away, maybe? There is a man in a white shirt, standing by the road now. His arms on his hips. He is just watching the children of other families run around and cars passing. Waiting. Just watching. Listening to languages of a different skin. A neutral face. No comments. And here I am. Removed and part of this environment at the same time. Sitting on a green bench. By myself. Leaving now. (I just got eight hours of rest, even though the night was plagued with nightmares of sexual assault and a sense of hopelessness. Strange faces peering at me and trying to hold me in all the bare places. Discomfort. It is the 20th of June, early afternoon, and I am now on a bus out of my neighbourhood. Feeling pretty well rested, surprisingly. Maybe it is all the greenery along the highway, and how the world falls behind me one metre at a time. Somehow, being an extrovert made me more introverted. I love being around close friends and people I love. Always trying to make plans to meet, catch up and engage in activities together. It is just nice to be around people I feel so safe around. It is almost a luxury, sometimes, when the environment or circumstance just simply do not allow it to happen. And for that day or two, I completely forget the little voice in my head that has conversations with me. Never-ending strings of thoughts that follow every decision I make, every move I take. Yet, when the day ends and all the joy has been expressed, it is exhaustion and slight depressive tendencies that take over. So drained. I am unsure if being tired made me need lone time, or if needing lone time made me tired. Over the years, with everyone reaching typical crossroads in their lives and going off to pursue life in whichever way they want, plans do not happen that often. Somehow my relationships are all maintained in a simple manner of trust, comfort and distance. Everybody has their own circles in their solar system and maybe I am on another planet further away. But still in rotation, though at a different pace and even time. And I think that’s a blessing. That no matter how far, how distant and how silent the relationship has been, I have always managed to find my way back to them. Back to the company I have grown to love so much, listen to all the separate adventures we have had and to witness the changes in the people around me. And to still know that there’s love. Respect and a feeling of coming together. In new fits and adaptations of ourselves, at the core still the same. Today, I had this sudden thought and smiled to myself. Pretty blessed in some ways, I am. And that’s enough, for today. This entry got lost among all the notes I am yet to clear, and have accumulated over this long period of two years using this iPhone 6. These were some thoughts I had or that came to me when I visited Bangkok and Hua Hin last year, 2016. I realised that some thoughts or notions that I perceive as natural, is not at all that, but a result of the culture I grew up in – the environment, social expectations and the wants everyone has been taught to aspire towards. This made me break down so many layers of myself, that confused me for a while but also acknowledge how my person is still a product of my own experiences. Wanting to go against societal norms is also a product of the system. So how much of myself is really just my own person? Is that even possible or is all I have an outer shell? With the thoughts, feelings and values a specific sieving through all that I know and placing an opinion there to secure my place? I am not sure if I have shared it before, but here’s the note I have. – what makes a country a country? If Thailand upgraded and moved up the economical, social ladder, would we still see its appeal? – do we romanticise it for its poverty? Taking photos of guards and the poor for aesthetic? Because we don’t feel the same in our own country? – choice is powerful. Knowing what you can want or deserve changes a lot of things. – kids busking. How many of them continue their education? Or even if they are studying, are they encouraged to excel, fulfil their potential and kept curious? – Tuk Tuk driver. Almost like the street dogs we see. Roaming and hoping. Existing mostly for the weekend crowds and when weekdays, hope to get a ride. Otherwise they nap to get the hunger to go away. They try so hard but the work does not always pay off. – how many of these people we see get to travel? Or want to travel? How do they feel when they see tourists? – how many of them are resigned to this? Seeing their families go through it, and now it is just their turn? Is this truly their fate? Resignation to the everyday life. In a way, there is a pleasure because they stopped looking ahead and are content with what they see in front of them. But where is the fight? Should there be a fight? – the ability to choose to fight for a passion is a privilege. – Has poverty elsewhere become a sort of perverse tourism? – Poverty should not equal to culture and feel of a country. Everyone has the right to move on, especially when it is for the best of the people. Yet, that sort of progress should not be forced but perhaps guided along? (Somehow, being bald for an identifying woman is so much tougher than an identifying man. So much of femininity seems to be encompassed in those locks, even though they really are just dead cells growing out of your head. So going bald seemed exciting at first, when I first said I would do it. After some thought, more and more instances started popping up in my head of how it may affect the way other people viewed me, or even the sort of jobs I could take on. How much will I miss my hair? Actually, I do play with my hair a lot when I am bored or distracted. Braiding, twisting, changing my hairstyle, dyeing it, letting it cover my face, keeping it away from my face, letting others touch it. I wonder how I will look. How much does my hair affect my appearance? Will having it missing change anything? I regret saying I will do it so readily. Will the guys talking to me now stop just because my hair is lost? Will it be radio silence from now on? Will I be less female in comparison to my counterparts that grew their hair out? I wonder if this job will take me if I tell them I am bald for the moment. Maybe I should get a wig. What the hell am I going to do with the hair package I had from before? Why did I get a hair package when I didn’t even care about my hair that much from the start? I need to learn how to be more firm with my “no”s from now on. How will I feel with this change? Will I cope well? Is there anything to cope with in the first place? It is just hair. I should wear a cap to tuition, in case my tutee’s mum freaks out over this sudden change. What am I going to do when it starts growing out? It will look so chaotic. Are there any make up tutorials for contouring the face with a bald head? Maybe I should use make up when I go out to look more feminine. How much does my hair define my gender? And why should it? Why am I so concerned? Nothing should change, but I think it will. It is just hair though.